Our team looks after the cross-government publishing API application and we were recently tasked with improving how content dependencies are managed. On the GOV.UK website, any piece of content may hold links to related articles or translations. In each case there’s a dependency between the content linking out and the linked content. The new publishing API is being developed as a single method of publishing for all of our applications including Whitehall, Specialist Publisher and Travel Advice Publisher. The first part of the platform to be built was the content-store, which serves as a central repository for all published content. Items in the content-store database used to be stored with full details of their own content, and links to other items were represented as IDs (the links weren’t expanded and stored inside the content). The content-store expanded these links at run time, converting the IDs into text and URLs, but this lead to long request times and scaling problems. Because the content-store had a lot of complexity, we wanted to turn it into a simple caching layer with no responsibility for determining links or storing content dynamic information. The new publishing API was to be the canonical source of content and we just needed some way of updating content whenever links changed (as this would no longer be determined by the content-store at run time). We now update linked content automatically within the publishing API through the use of LinkSets. The LinkSets ensure that when you make a query, the publishing API can immediately find the parent content and its dependencies. 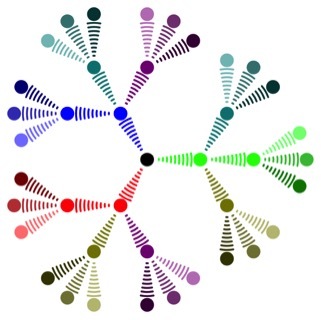 The LinkSet identifies all the relations between articles, like vertices in a graph, and is saved within PostgreSQL (the publishing API is backed by a PostgreSQL database). We create a LinkSet for each article before it’s published. The content store is to be a simple cache, storing no details of content of link IDs. Say an ‘income tax’ article has a parent article called ‘money and tax’, and a child called ‘tax codes’. 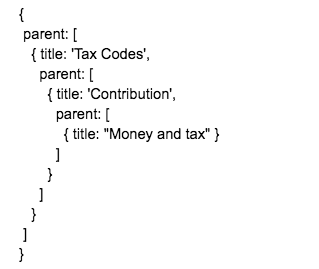 Meanwhile, the ‘tax codes’ content has a child article of ‘tax numbers’. 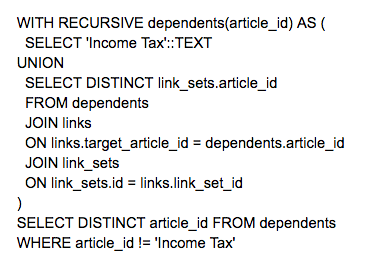 Furthermore, the ‘income tax’ content links to an ‘emergency tax’ article this in turn links back to ‘income tax’. There are two sides to the query, one for following dependencies down the graph, and one for following it up. In the following query example, I’ll just be showing how we followed dependencies down the graph (since following dependencies upwards is a very similar process). You can follow Douglas on Twitter, sign up now for email updates from this blog or subscribe to the feed. Very interesting, as a freelance web design at http://5fifty.co.uk/ this is definitely going to come in handy for a client I have on the go at the moment. Thanks! I will be following this blog closely.